Income of the province of Surigao del Norte increased to 5.85% or totaled to P555,604,948.26 in fiscal year 2010 up to the first quarter of 2011 as compared to total income of P524,882,523.73 only in 2009, Surigao del Norte treasurer’s office official financial report claimed. But the most significant improvement in the province’ financial management was the significant decrease of expenditures by about 6.61%, same report claimed. Because of the significant financial improvement Surigao del Norte has achieved, the Department of Finance has given the province an award for their sound fiscal management, one of the best improved among local governments in Caraga region. The report added that of the total income in 2010, 89.3% or 496,155,631.00 came from our share of the Internal Revenue Allotment (IRA). The report also claimed the significant improvement of sound fiscal management of the province was initiated during the new administration of the province headed by Governor Sol Folcadilla Matugas. It also added that same report will be one of the highlights of Surigao del Norte Governor’s State of the Province Address (SOPA) today to be held at the newly refurbished Surigao del Norte Provincial Convention situated at downtown Surigao City today. 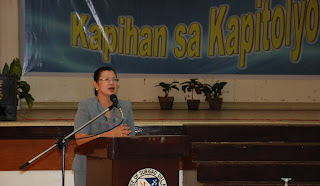 Matugas claimed amendments in the province’ revenue code, adoption of austerity measures such as the selective filling up of permanent positions, limiting the number of casuals and job order employees to the barest minimum made significant contributions in the austerity initiatives she initiated. Matugas added that she will continue implementing rationalization of fuel consumption and implementing the new procurement system through the Procurement Depot to ensure that maximum benefits were derived from the limited resources. “Strengthening our financial system was on top of our priorities. Efforts to beef up revenue collection and enhance resource allocation and utilization were manifested in the implementation of debt restructuring, implementation of Enhanced Tax Revenue Assessment and Collection System (ETRACS) and other tax collection strategies” Matugas in said press statement claimed.